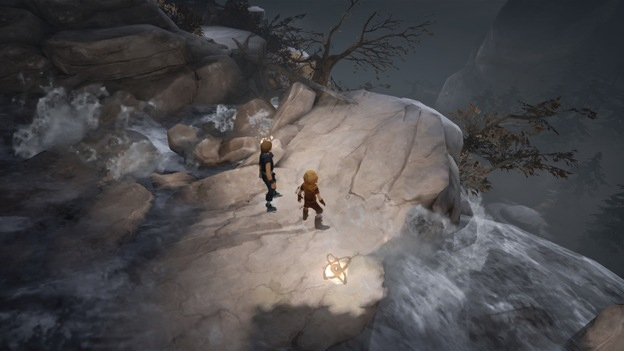 Brothers: A Tale of Two Sons must be one of the quietest games ever made. 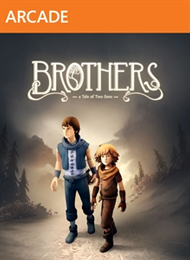 There's no shooting, no explosions, and no car chases, just two brothers exploring a fantasy world on a quest to cure their sick father. There is dialogue, but it all takes place in a fictional tongue, and it's not subtitled--the most you can do is read the characters' body language, interpreting it the way you'd interpret a cutscene in a LEGO game. The characters don't even have names. And there's music, but it consists largely of basic chord movements, evoking peacefulness at some moments and tension at others. In a lesser game, all of this would amount to boredom. But even after limiting themselves this way, Starbreeze Studios and Swedish film director Josef Fares managed to create a captivating and surprisingly touching experience. Brothers is mentally stimulating, emotionally engaging, and artistically innovative--an example of video gaming at its best. 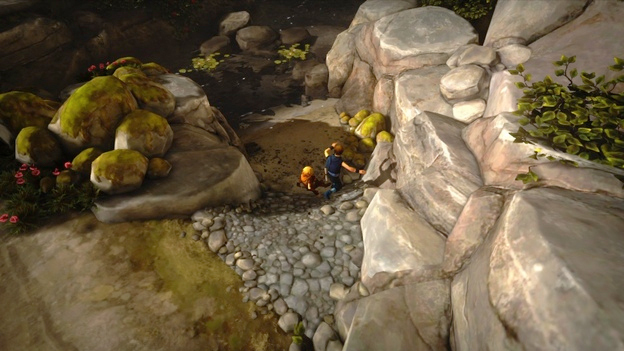 Much of the game's enchanting nature comes from its unique gameplay premise. While the plot would seem to lend itself to co-op play--how many actual pairs of brothers have passed the time playing video games together?-- this is a single-player game. From an overhead view, you are in charge of guiding both brothers on their paths through an extensive series of puzzles and the occasional enemy encounter. There's nothing else quite like it, but the closest comparison I can come up with is this: It's Lara Croft and the Guardian of Light, with no guns, played in Ms. Splosion Man's "2 Girls 1 Controller" mode. To make this manageable, the developers kept the controls incredibly simple. Each joystick controls a brother, the trigger buttons make the brothers interact with the world (everything from picking guards' pockets to lifting up sheep), and the bumpers rotate the camera. That’s it. But this can be deviously tricky. For whatever reason, even if you've spent a lot of time with a controller in your hand, you will probably have trouble doing two completely different things at once. In any other game, your hands work together to make a character do something, but here they have to work independently, as if you had two brains. The puzzles may not be overly elaborate, but they do require a certain amount of coordination; you might need to have one brother run on a hamster wheel while another crosses a bridge or make the brothers work together to move a bulky object through narrow corridors. (If you've ever navigated a couch or mattress through tight turns while moving, your experience will come in handy here.) At first, it's easy to become frustrated and blame the game for your limitations. But in the end, it turns out they are, in fact, your limitations, and you master the art of moving a separate character with each hand. What was initially infuriating becomes soothing. This unique gameplay setup is enough to make Brothers a compelling game. But its innovative storytelling completes the package. It first hit home for me that I was playing something special in one of the game's earliest scenes. I was guiding the brothers along, solving puzzles as I went--one kid pulls a lever, the other climbs a rope, and so on--when I came across an ogre. The ogre was in tears. He spoke to the brothers in the game's language, and then he began helping the brothers make their way through the world, tossing them to high platforms and even using his limbs to make a bridge.